Rajiv is a qualified physician who did his MPhil and PhD in Epidemiology at the University of Cambridge. He was a Commonwealth and Gates Cambridge scholar. Rajiv has also received advanced training in Nutritional Epidemiology at the Imperial College London, in Genetic Epidemiology at the Netherlands Institute of Health Sciences (as an Erasmus Fellow) and in Pragmatic Trials at the London School of Hygiene and Tropical Medicine. He was elected a Fellow of the UK Royal Society for Public Health and a Fellow of the European Society of Cardiology. 2) The Strengthening Health research by Improving Noncommunicable disease Epidemiology in Sri Lanka (SHINES, 20,000-person prospective cohort study in Sri Lanka). 4) The Bangladesh Risk of Acute Vascular Events (BRAVE, a 16,000-person case-control study of cardiovascular disease). Rajiv also serves as the Scientific Director and joint Principal Investigator of the RCUK-funded (£8M) CAPABLE global health programme in Bangladesh. Rajiv’s research interests are in evaluating roles of environmental (eg, diet and toxic metals) and their associated genetic factors that may influence the risk of chronic non-communicable diseases. 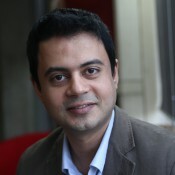 Rajiv has received significant global media attention for his research on the fatty acids and heart disease (BBC, CNN, NY Times, Time Magazine, The Guardian), fatty acids and stroke (NY Times, The Times, The Australian, CBC News), vitamin D and mortality (Reuters, NY Times) and Global Health initiatives (Dhaka Tribune, BDnews24, Huffington Post, The Wall Street Journal, FAPESP Brazil). In 2013, Rajiv received the Bill Gates Senior Award for contributions to global health. Rajiv sits on the departmental Admissions and the Management Committees for the MPhil courses in Epidemiology and Public Health in Cambridge, as well as leads the Global Health module which he founded in 2011. He also leads the Global Health Summer Course in Erasmus Medical University in the Netherlands and the Chronic Non-communicable Disease module in German Institute of Tropical Medicine in Berlin (Charité). Additionally, Rajiv has given keynote lectures on concepts of Epidemiology, Individual Participant Data Meta-analysis, and Global Health in various universities and scientific workshops internationally. Zhao W, Rasheed A, Tikkanen E, Lee J-J, Butterworth AS, Howson JMM, Assimes TL, Chowdhury R, Orho-Melander M, Damrauer S et al (2017). Identification of new susceptibility loci for type 2 diabetes and shared etiological pathways with coronary heart disease. Nat Genet 2017;49(10):1450-1457. Howson JMM, Zhao W, Barnes DR, Ho WK, Young R, Paul DS, Waite LL,..Chowdhury R; EPIC-CVD, Chen YI, Nordestgaard BG, Assimes, TL, Danesh J, Butterworth AS, Saleheen D (2017). Fifteen new risk loci for coronary artery disease highlight arterial-wall-specific mechanisms. Nat Genet. 2017;49(7):1113-1119. Myocardial Infarction Genetics and CARDIoGRAM Exome Consortia Investigators (2016). Coding variation in ANGPTL4, LPL, and SVEP1 and the risk of coronary disease (2016). N Engl J Med. 24;374(12):1134-44. Franco, O. H., Chowdhury R, Koromani, F., Portilla, E., O’Connor, A., Bramer, W. M., Troup, J., Muka, T. (2016). Association between use of plant-based therapies and menopausal symptoms (2016). JAMA. 21;315(23):2554-63. Vos, T., Barber, R. M., Bell, B., Bertozzi-Villa, A., Biryukov, S., Bolliger, I., . Chowdhury, R….. Artaman, A. (2015). Global, regional, and national incidence, prevalence, and years lived with disability for 301 acute and chronic diseases and injuries in 188 countries, 1990-2013: A systematic analysis for the Global Burden of Disease Study 2013 (2015). The Lancet, 386(9995), 743-800. Zanoni, P., Khetarpal, S. A., Larach, D. B., Hancock-Cerutti, W. F., Millar, J. S., Cuchel, M.,..Chowdhury, R, …Samani R. Global Lipids Genetics Consortium. (2016). Rare variant in scavenger receptor BI raises HDL cholesterol and increases risk of coronary heart disease. Science, 351(6278), 1166-1171. Newton, J. N., Briggs, A. D., Murray, C. J., Dicker, D., Foreman, K. J., Wang, H., . Chowdhury, R….. Davis, A. C. (2015). Changes in health in England, with analysis by English regions and areas of deprivation, 1990-2013: a systematic analysis for the Global Burden of Disease Study 2013.. The Lancet, 386(10010), 2257-2274. Murray, C. J. L., Barber, R. M., Foreman, K. J., Ozgoren, A. A., Abd-Allah, F., Abera, S. F., . Chowdhury R.. . . Başara, B. B. (2015). Global, regional, and national disability-adjusted life years (DALYs) for 306 diseases and injuries and healthy life expectancy (HALE) for 188 countries, 1990-2013: Quantifying the epidemiological transition. The Lancet, 386(10009), 2145-2191. Forouzanfar, M. H., Alexander, L., Anderson, H. R., Bachman, V. F., Biryukov, S., Brauer, M., Chowdhury, R… . . Basu, S. (2015). Global, regional, and national comparative risk assessment of 79 behavioural, environmental and occupational, and metabolic risks or clusters of risks in 188 countries, 1990-2013: A systematic analysis for the Global Burden of Disease Study 2013. The Lancet, 386(10010), 2287-2323. Chowdhury, R., Alam, D. S., Fakir, I. I., Adnan, S. D., Naheed, A., Tasmin, I., . . . Di Angelantonio, E. (2015). The Bangladesh Risk of Acute Vascular Events (BRAVE) Study: objectives and design.. Eur J Epidemiol, 30(7), 577-587. Chowdhury, R*., Baena, C. P.*, Schio, N. A., Sabbag, A. E., Guarita-Souza, L. C., Olandoski, M., . . . Faria-Neto, J. R. (2013). Ischaemic heart disease deaths in Brazil: Current trends, regional disparities and future projections. Heart, 99(18), 1359-1364. Chowdhury, R., Warnakula, S., Kunutsor, S., Crowe, F., Ward, H. A., Johnson, L., . . Di Angelantonio, E. (2014). Association of dietary, circulating, and supplement fatty acids with coronary risk: a systematic review and meta-analysis.. Ann Intern Med, 160(6), 398-406. Chowdhury, R*., Harshfield, E*., Harhay, M. N., et al. (2015). Association of hypertension and hyperglycaemia with socioeconomic contexts in resource-poor settings: the Bangladesh Demographic and Health Survey.. Int J Epidemiol, 44(5), 1625-1636. Chowdhury, R., Kunutsor, S., Vitezova, A., Oliver-Williams, C., . . . Franco, O. H. (2014). Vitamin D and risk of cause specific death: systematic review and meta-analysis of observational cohort and randomised intervention studies.. BMJ, 348, g1903. Chowdhury, R., Johnson, L., and Steur, M. (2014). Trans fatty acid isomers in mortality and incident coronary heart disease risk.. J Am Heart Assoc, 3(4). Chowdhury, R., Kunutsor, S., & Vitezova, A. (2014). Review: Vitamin D-3 supplementation may reduce mortality in adults; vitamin D-2 does not. Ann Intern Med, 161(2). Chowdhury, R., Khan, H., Heydon, E., Shroufi, A., Fahimi, S., Moore, C., . . . Franco, O. H. (2013). Adherence to cardiovascular therapy: a meta-analysis of prevalence and clinical consequences.. Eur Heart J, 34(38), 2940-2948. Chowdhury, R., Stevens, S., Gorman, D., Pan, A., Warnakula, S., Chowdhury, S., . . . Franco, O. H. (2012). Association between fish consumption, long chain omega 3 fatty acids, and risk of cerebrovascular disease: systematic review and meta-analysis.. BMJ, 345, e6698. Chowdhury, R., Stevens, S., Ward, H., Chowdhury, S., Sajjad, A., & Franco, O. H. (2012). Circulating vitamin D, calcium and risk of cerebrovascular disease: a systematic review and meta-analysis.. Eur J Epidemiol, 27(8), 581-591. Chowdhury, R.*, Di Angelantonio, E.*, Sarwar, N., Aspelund, T., Danesh, J., & Gudnason, V. (2010). Chronic kidney disease and risk of major cardiovascular disease and non-vascular mortality: prospective population based cohort study.. BMJ, 341, c4986. Chowdhury, R*., Di Angelantonio, E*., Sarwar, N., Ray, K. K., Gobin, R., Saleheen, D., . . . Danesh, J. (2009). B-type natriuretic peptides and cardiovascular risk: systematic review and meta-analysis of 40 prospective studies.. Circulation, 120(22), 2177-2187. Willeit, P., Freitag, D. F., Laukkanen, J. A., Chowdhury, S.,.. Mayr, M., . . . Chowdhury, R. (2015). Asymmetric dimethylarginine and cardiovascular risk: systematic review and meta-analysis of 22 prospective studies.. J Am Heart Assoc, 4(6), e001833. 25. Chowdhury, R., and Steur, M. (2015). Dietary polyunsaturated Fatty acids and chronic systemic inflammation–a potentially intriguing link.. Am J Epidemiol, 181(11), 857-860.